Tuberculosis (TB) is a major public health problem in developing countries; antibiotic tolerance and resistance further complicates this problem. Mycobacterium tuberculosis (M.tb), the causative agent of TB, can tolerate host stresses and antibiotics; hence, prolonged antimicrobial treatment is required to cure the infection. Factors which may contribute to M.tb survival under stress conditions are the unique cellular adaptations of the bacilli. These include cell length heterogeneity, multi-layered cell envelope and accumulation of lipid inclusions, and these have been implicated in differential susceptibility to antibiotics. However, there is limited understanding of these cellular adaptations in clinical M.tb isolates, and how host stresses influence these adaptations. We investigated the influence of host stresses and antibiotic resistance on the cell length distribution in a large set of clinical M.tb isolates (n = 158), from pulmonary TB patients in Vietnam. This revealed that host stresses and rifampicin resistance significantly increased the cell length distribution of clinical M.tb isolates. We selected few clinical M.tb isolates (n = 8) from this study and further analyzed the influence of host stresses on the cellular ultrastructure of the bacilli. Ultrastructural analysis of M.tb isolates revealed cell envelope modifications and accumulation of lipid inclusions in sputum, under oxidative stress and iron deficiency. Currently we are investigating the level of antibiotic tolerance in clinical M.tb isolates and its implications for treatment progression and emergence of antibiotic resistance. 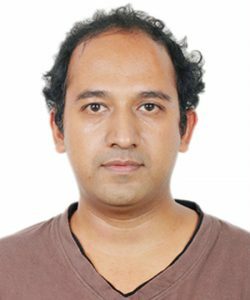 Dr. Vijay Srinivasan has done his PhD (2014) from the Indian Institute of Science, Bangalore, India. He has been working as a post-doctoral researcher at the University of Oxford from 2015. He has been studying the cell biology, host stress and antibiotic tolerance of clinical Mycobacterium tuberculosis isolates at the Oxford university clinical research unit, Ho Chi Minh city, Vietnam. He has published nine peer reviewed publications in international journals on cellular adaptations, population heterogeneity and antibiotic tolerance of mycobacterial species.